I face-off against Marilyn vos Savant? 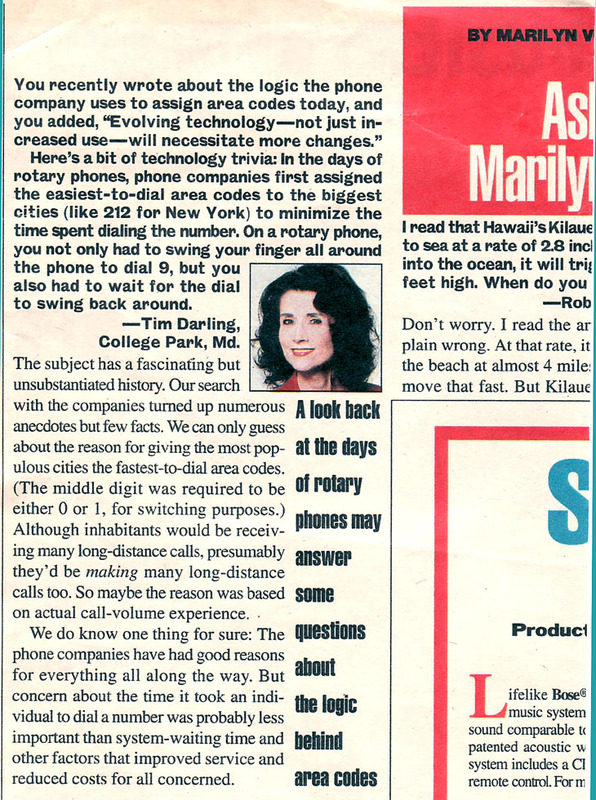 This is a clipping from the "Ask Marilyn" column of the August 16, 1998 issue of Parade magazine which is distributed with most major Sunday newspapers in the US. I responded to an article she had printed earlier where she claimed that the area codes were allocated mostly arbitrarily, in contrast to zip codes. This is untrue. Marilyn vos Savant claims to be listed in the "Guinness Book of World Records" Hall of Fame for "Highest IQ" in the footnote in her column. How that makes her qualified to lecture on telephone switching, I don't know. Of course, I'm far from qualified either, but at least I had an interesting story. I think my answer is right. First, Marilyn assumed I meant that the phone company did this for customer experience - that may be true. But another reason the area codes for largest cities have the lowest numbers was due to costs: that time on the line in the 1950s was the driving cost for the carriers and the time customers spent dialing were costs they couldn't charge to recover. Her response that "although inhabitants would be receiving many long-distance calls, presumably they'd be making many long-distance calls too" makes no sense. The key is that there is a limited set of small number area codes to work with. So they had to assign them to areas with the highest densities to ensure that they were assigned to as many phone numbers as possible. If you could give Sioux City, Cedar Falls, and Wichita all the same area code to "fake" one big city, then her argument makes sense. But that obviously doesn't happen. Outside of the major cities, most area codes are undersaturated: there are plenty of phone numbers that could be assigned under them which are never used. Further, if you look at all of the calls between Sioux City and New York, are they evenly balanced directionally? No - there are more calls into New York because it's a major business hub. All text and pictures copyright © 2007 Tim Darling.